This stylish Dinner-Jacket print T-Shirt really glows in the dark, Great for "smart-casual" parties or even formal events, Dinner Jacket T Shirts are a fun alternative to renting a tux! 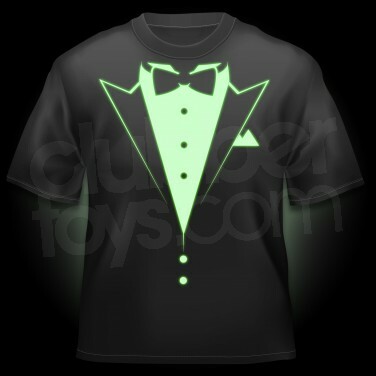 The Dinner Jacket Glow in the dark T-Shirt is a comfortable black cotton tee with a stylish glow in the dark Dinner Jacket print. Customise your t-shirt with glow in the dark designs when you wear the fantastic new Glow Graffi-Tee T-Shirt!